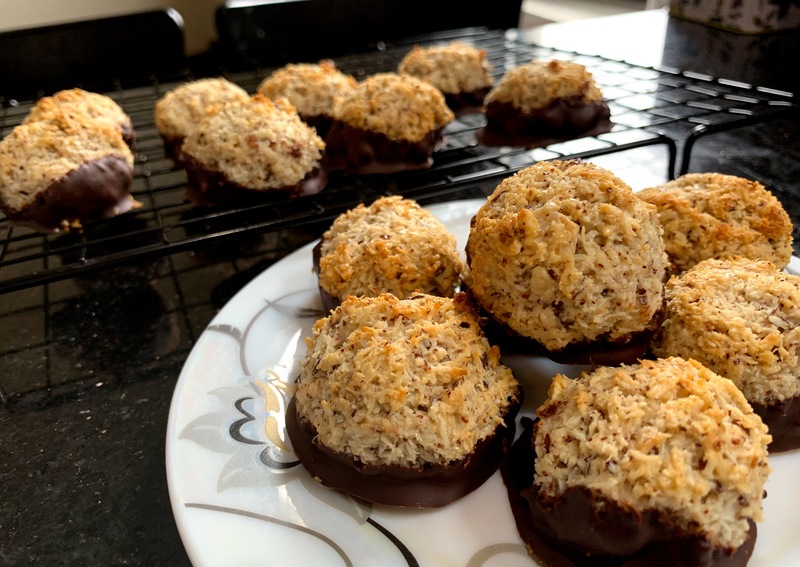 Coconut macaroons (not to be confused with French macarons) are a classic spring holiday dessert with origins in 18th century Italy. The flourless cookies are served at Passover seders and also shaped into “nests” to fill with Easter candy. I am not a fan of the store-bought variety, which is often sticky and overly sweet. After years of making the same two desserts, chocolate bark and chocolate hazelnut truffle squares, for Passover, I decided to give homemade macaroons a shot. I used unsweetened coconut and added finely ground hazelnuts, one of my favorite dessert flavors. Borrowing a technique from an excellent macaroon recipe on the blog Love from the Oven, I added egg whites to bind the dough together. These are especially delicious dipped in dark chocolate. Toast hazelnuts until golden and fragrant. Set aside to cool, then grind in a food processor.In a large mixing bowl, combined coconut, hazelnuts, and condensed milk. Add remaining ingredients, stirring until well-combined. Scoop dough using a tablespoon or small ice cream scoop, and place on prepared baking sheet; the macaroons will retain their shape as they bake, so feel free to arrange them closely together. Bake for around 23-25 minutes until surfaces begin to turn golden brown. Let cool for a few minutes on the baking sheet, then transfer to a cooling rack. Dip the bottoms of the macaroons into the melted chocolate, and place on wax or parchment paper to set. If room is warm, place in refrigerator to set.